The Jasmine is a bushy vine which we have trained into tree form. It has shiny dark leaves and fragrant white flowers. 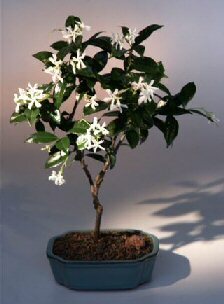 The waxy snow white flowers are about 1" across, borne in clusters of 3-12 and intensely fragrant. They fade to pink as they age. The White Jasmine blooms throughout the summer and almost continuously in warm climates. Great indoor bonsai. Suitable 6" x 8" humidity tray is recommended.